Scars—whether they're caused by accidents or by surgery—are unpredictable. Scars are known to have profound psychological implications like lowering the self-esteem substantially. The way a scar develops depends as much on how your body heals as it does on the original injury or on the surgeon's skills. Many scars that appear large and unattractive at first may become less noticeable with time. Some can be treated with steroids to relieve symptoms such as tenderness and itching. Scars may or may not be removed permanently, but in the hands of expert plastic surgeons they can be improved in appearance, made less obvious through the injection or application of certain steroid medications or through surgical procedures known as scar revisions. How much a scar bothers someone depends on person to person. 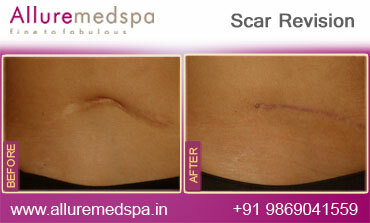 Different types of scars entail different solutions; Surgical or non-surgical. 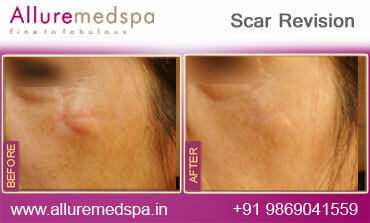 We shall list all types pf scars and their possible treatments in the ‘Procedure’ section. Different kind of scars entail different kind of solutions. The treatment procedure involved might not always be a surgical one. It depends on the nature and cause of the scar. You should be back at work in a day or two, and the stitches will be removed in a few days. A skin graft (see the section on skin grafting) is occasionally used, although the site from which the graft was taken may then develop a keloid. Hypertrophic scars are often confused with keloids, since both tend to be thick, red, and raised. 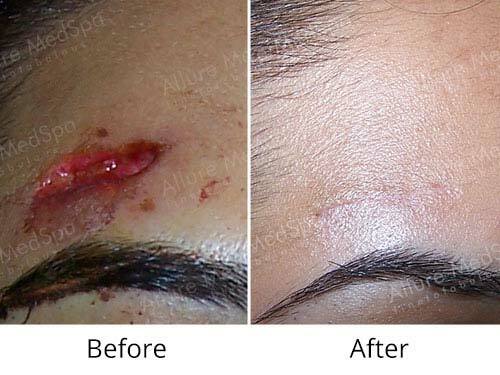 Hypertrophic scars, however, remain within the boundaries of the original incision or wound. They often improve on their own or with the help of steroid applications or injections. If a conservative approach doesn't appear to be effective, hypertrophic scars can often be improved surgically. The plastic surgeon will remove excess scar tissue and may reposition the incision so that it heals in a less visible pattern. This surgery may be done under local or general anesthesia, depending on the scar's location and what you and your surgeon decide. You may receive steroid injections during surgery and at intervals for up to two years afterward to prevent the thick scar from reforming. Because of its location, a facial scar is frequently considered a cosmetic problem, whether or not it is hypertrophic. 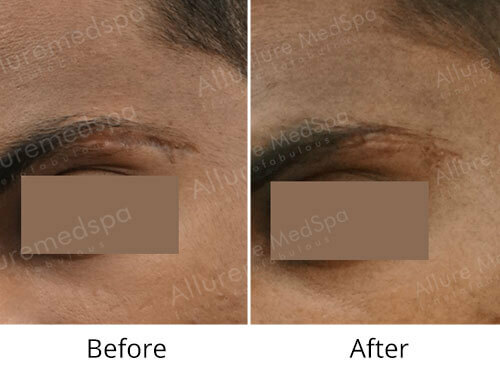 If the scar lies across the natural skin creases (or "lines of relaxation") the surgeon may be able to reposition it to run parallel to these lines, where it will be less conspicuous (Z-plasty). You can enhance your chances of getting rid of scars and reduce your risks involved in the surgery by choosing a qualified plastic surgeon and closely following his or her advice, both before surgery and in follow-up care. Top plastic surgeon Dr. Milan Doshi is renowned for his finesse and precision in cosmetic surgeries and related procedures. Scar revisionis one of the procedures he performs. 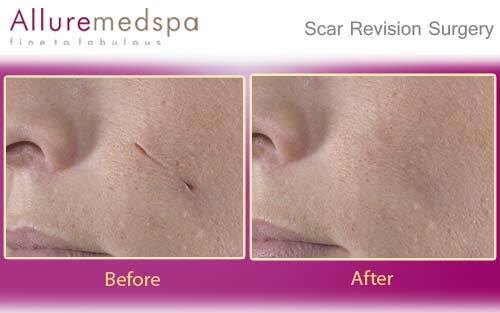 While no scar can be removed completely, an experienced plastic surgeon can often improve the appearance of a scar, making it less obvious through the injection or application of certain steroid medications or through surgical procedures known as Scar Revisions.Dr. Milan Doshi at Allure MedSpa ensures that. Z-plasty is usually performed as an outpatient procedure under local anesthesia. 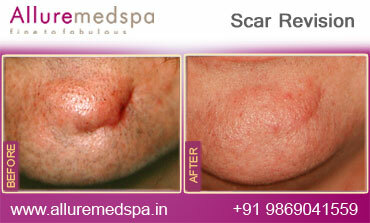 Skin grafts and flaps are more serious than other forms of scar surgery. They're more likely to be performed in a hospital as inpatient procedures using general anesthesia. We at Allure MedSpa care follow highest standards of privacy and confidentiality ensuring additional comfort for our patients. In Z-Plasty the wound is closed with fine stitches, which are removed a few days later. After skin-grafting and Flap Surgery, the treated area may take several weeks or months to heal, and a support garment or bandage may be necessary for up to a year. Allure MedSpa which is renowned for its state-of-the-art internationally acclaimed services, offers affordable and cost effective bariatric procedures. To know more about the cost of your procedure request a consult by filling the form below. Your consultation is your chance to ask questions about Scar Revision and put your mind at rest. Your surgeon will be able to offer you full explanations and answers to all of your queries. 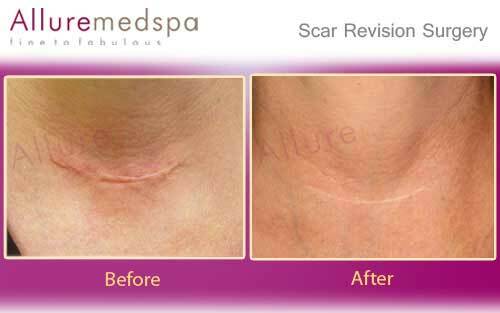 Your surgeon/ cosmetologist will examine the causes and the nature of your scar and recommend the best option to treat the same. Our comprehensive aftercare program focuses on your unique, individual needs. Our team at Allure MedSpa will work with you to provide all the help, support and expert advice and aftercare plan specific to you. Your pre-operative requirements will depend on the procedure opted for. Depending upon the treatment recommended, your surgeon will instruct you about any preparation required before undergoing the procedure. The healing process is gradual and also depends on the nature of procedure performed. As you heal, keep in mind that no scar can be removed completely; the degree of improvement depends on the size and direction of your scar, the nature and quality of your skin, and how well you care for the wound after the operation. The final results of your surgery may take a year or more too. 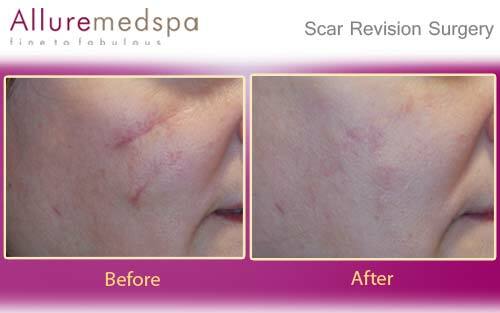 Scar revision reduces the appearance of scars and helps to prevent certain types of scars from recurring, including raised, red keloid and hypertrophic scars. 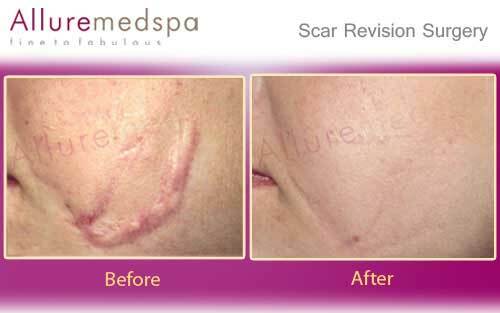 Today, the gold standard for scar revision is laser scar removal. Depending on the scar the surgery usually lasts for half an hour and is done under local anaesthesia. How long after the surgery can I see the final result? The recovery time can differ. Stitches are usually removed 10-14 days after the surgery, after which we advise you to use creams that helps healing to achieve the best results.